We have biked Hobble Creek several times in the past but we always took the “Left Fork” at the junction up past the Hobble Creek Golf Course. We noticed that the Utah Velo has a ride schedule in a couple weeks that goes up the “Right Fork”. So we decided to check that out. Biking over to Hobble Creek from our home in Orem would be about 55 miles. It was one of the warmest days yet during our visit in Utah, in the mid 70’s, but on the windy side. We wanted to get in a good ride today because the forecast for the next several days shows cold and rain. We made our way down to University Avenue and took that through Provo. We were moving over 20 mph due to a tail wind we figured it would be a headwind on the way back. We then followed the route the Utah Velo club uses to get over to Springville. We had taken that route before but seemed have a hard time remembering where to turn. So this time I downloaded the course on my Garmin Edge 500 and followed the track, which made it easy where to turn. After making our way up Canyon Road, we reach the junction where we usually turn left, and instead headed up the right leg. There was a sign that showed 8 miles to some place so we thought this might be the length, which would be twice as long as the left fork. Initially the road surface was a bit rough so I was thinking this might not be so great, but soon we reached new pavement, which was smooth, the type you like to bike on. It was a nice windy road, with virtually now traffic. When we started from our house it was mostly sunny, but by now it had turned mostly cloudy, but the temperature was very nice. We heard some gun shots and started to wonder if there was some hunters ahead. We then came upon a couple of guys who were doing target practice against a hill, off the side of the road. Just short of 7 miles from the fork, we finally reached a point where the road was closed. It is typical here for roads to be closed for the winter and sometimes they don’t open those as soon as the snow is gone. Last week I found that going up Squaw Peak and went ahead through the closed road and found other bikers up the hill. But we felt that might not be wise here because it was too remote and besides, those guys were shooting guns back down the road. We had now biked nearly 28 miles, so that would be over 55 miles by the time we finished, so we turned around and headed back. When we made it near Provo, we stopped for lunch. Then it was 10 miles back home. By now the wind had shifted and once again we had a tail wind on University Ave, and were moving along at 22 mph. When we arrived at home, Anne biked past the driveway for a short distance and then circled around. When I asked what she was doing, she said she wanted to reach 55.55 miles. It was a fun ride. That evening I went to join the Utah Vello Club Tuesday evening ride. It was still warm but the forecast was for 25 mph our winds. With such a strong tail wind, I figured out it was a good chance to set a new PR going up Dry Creek. Even though I had already biked 55 miles earlier I still felt good and was able to climb the Dry Creek Hill climb, coming in 2nd place and a new PR for me. I ended up with 80 miles on the bike for the day. It has been some time since we were able to do a Saturday ride with the Utah Velo Club. 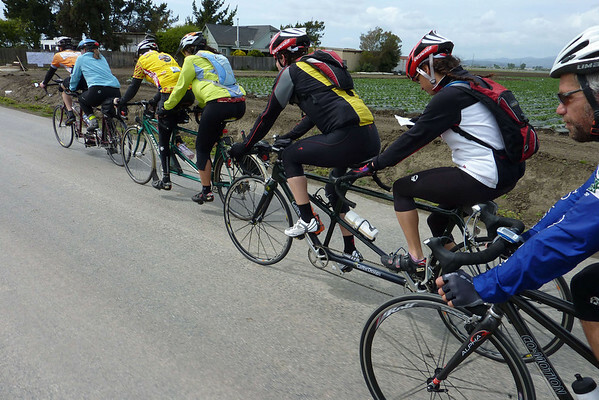 Last year we usually did those rides on the tandem because of the fast pace. This trip we only brought our single bikes so Anne was a bit nervous, but I was confident we would do fine. The ride didn’t start until 9 am, which was a good thing since it was very cold on Friday and early Saturday morning still found the weather in the 30’s. But by the time the ride started it had warmed to the mid 40’s and the sun was shining, which made it feel even warmer. About 15 others showed up and Anne was quick to notice there were no other women. The guys ranged in age from the 30’s up. Unlike most ACTC rides, the Utah Velo tends to ride fast and in a group. I did not know the route, so we had an incentive to keep up. Anne did great riding right in the pace line. The group would regroup about every 15-20 miles. We stayed connected for the first two re-groups. At each group we were taking off more clothes since the weather was warming up quite nicely. Then there was the only real climbing of the day and things tended to spread out. It was only the last 10 miles that we fell off the back of the main group, but by then we knew the rest of the route. We averaged 18 mph, which is probably the fastest Anne has ridden on her single bike for such a distance. It was only noon and we were done with the ride, unlike many ACTC rides which seem to go well into the afternoon. We stopped for lunch at In-N-Out, which had just opened nearby. For some reason a hamburger always tastes great after a hard ride. I wanted to do a bit more riding, so after returning home, I took off up the canyon. I first headed up the Alpine Road to Sundance. At Sundance, I took a side road inside the resort itself that I had never taken before. I only had my iPhone to take this photo. Going back down the canyon, I was riding into a strong headwind. I figured that after I went down the road and across the canyon to climb up South Fork, I would have the same headwind. But I didn’t notice any headwind while going up, but I certainly felt a strong headwind going down. Once I was back down to the main highway, I headed back down the Provo River trail yet again felt a strong headwind. So I felt this headwind while traveling in 3 different directions, all going down hill. I figure that the wind was just blowing hard up all canyon and side canyons. Interesting. So Anne end up with 50 miles for the day and I got in 80 miles. It has been about 3 weeks since I rode that far in a day. The weather has been a bit cool for this time of the year in California, but we really wanted to do the club ride that starts in Santa Cruz and goes over to Monterey, then return. We got up early since it would take an hour to drive to the ride start, which was at 8 am. As we went over Hecker Pass, the temperatures were dropping down to 36, but by the time we reached Santa Cruz it was up to 40 degrees. Since there was no wind, it didn’t seem too cold to ride, especially since we had brought plenty of warm clothes. 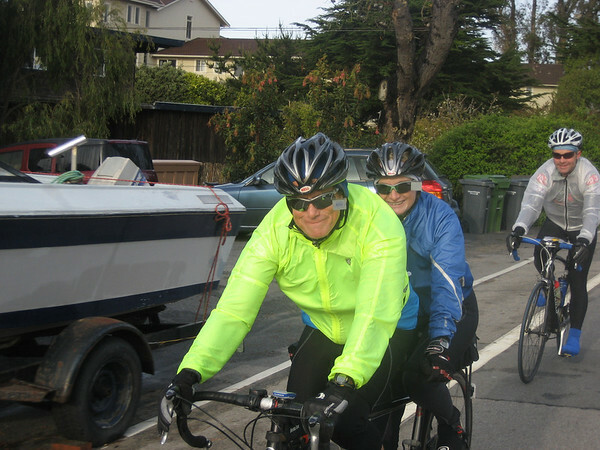 For a total of 108 miles, it would be the longest ride this year for Anne so we decided to take the tandem. Several others were taking their tandems also and there ended up with 6 tandems on the ride. The route started on the north end of Santa Cruz and headed south, along the ocean side of the town, Then through the Elkhorn Slough to Castroville. From there to Monterey, much of the route was on bike paths. You would think that it would be all flat, but there was considerable up and down climbing along the route so we ended up with 4800 feet of climbing by the end of the ride. We were lucky to have sunshine in the morning so the temperatures warmed up rather rapidly. 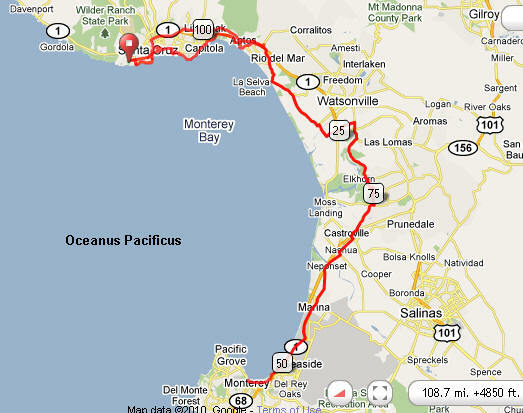 The last part of the ride went around Monterey Bay. It was pleasant enough by the time we arrive in Monterey for a stop at Fisherman’s Wharf and a bowl of clam chowder in a bread bowl. Then it was 54 miles back, retracing most of the path we had taken. As we neared the end, we were biking along Cliff Drive in Santa Cruz, with a spectacular view of the ocean. The waves were very large so after finishing the ride we drove back to take a few pictures. It was a fun day but a long ride. We were so hungry at the finish, that we decided to drive home via San Jose so we could stop and eat dinner at the Olive Garden.